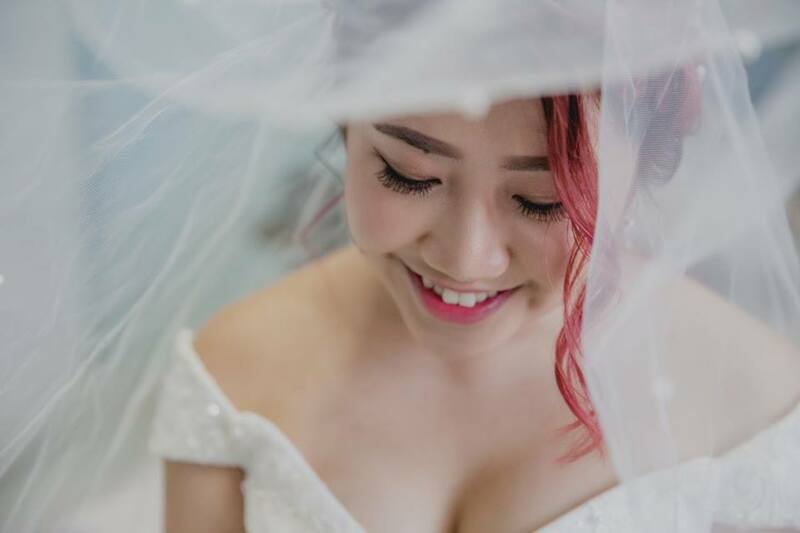 As you may already know, I'm not a very conventional bride by Singaporean standards. So about 2 days before the big day, I trooped down to Salon B for a total hair makeover. While I wanted a pinkish twinge to my hair, I did not want to look like the asian incarnation of namesake singer. 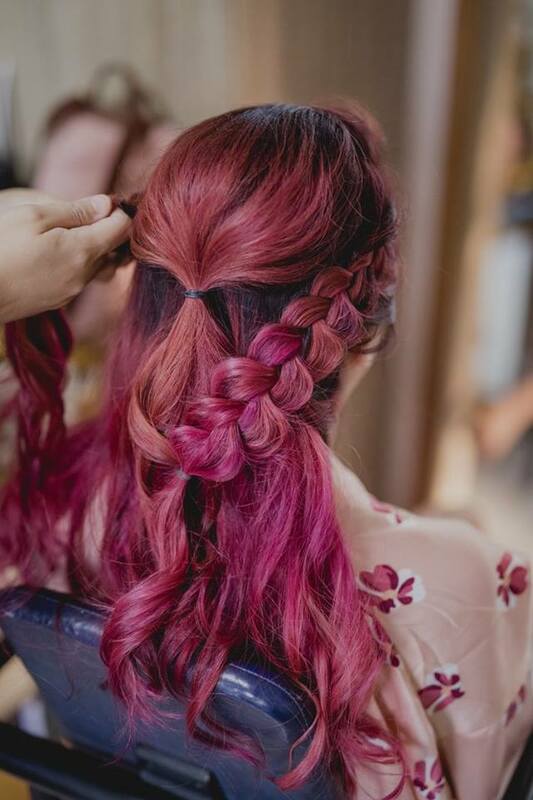 Louis had the brilliant idea of mixing 2 layers of color rather than do a solid rose pink shade; this gives a more understated, natural finish and adds the illusion of dimension. A solid hue actually looks unnatural on our yellow-undertone skin, and of course I placed my trust fully in him. Working on my older base of faded mageta purple, the session took a bit shorter since my strands were already bleached lighter. Louis started by adding a thinner layer from the bottom layers, then towards the top to achieve the lightness needed. I was pretty amazed how his discerning eye made 2 seemingly clashing colors to result into the exact shade I wanted. He also explained that this in order to give a shade dimension, its better to use two varying shades to give some form of contrast. The trick is to pick two shades that are similar in tone but slightly different color family. After a repeated run of shampooing and rinsing again (with treatment inbetween, because my hair was declared tangled beyond all human comprehension); I was finally ready to see the results. A quick blow dry and a curl later, here is how I looked right after the hair-makeover! Louie recommended me to shampoo it so it will fade out into a more subtle, softer shade and it was right. As much as I fell head over heels in love with this beautiful dark wine pink shade, Louie told me to use my normal shampoo to wash out the shade abit. I was abit reluctant despite the beautiful result was a tad darker than I expected, but he said by doing so I'll be able to achieve a beautiful pastel-like ombre pink. So I did so and as always, his prediction created the perfect rose-gold hue that showed perfectly in the photos! 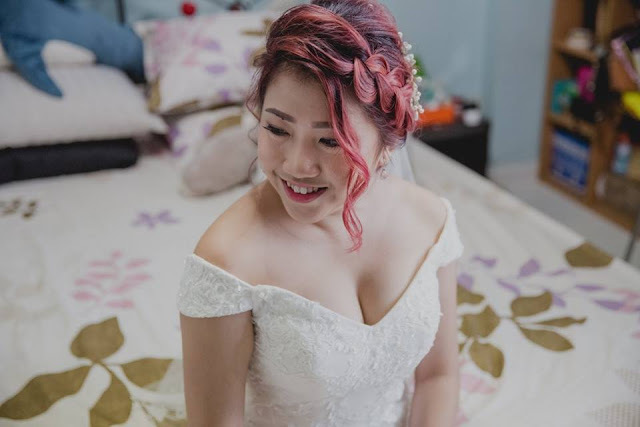 A big thank you again to my beloved sponsor Salon B for always being there to materialize all my crazy hair goals, including being a pink-haired bride. My husband was absolutely floored when he saw it, saying that it was the perfect complement for my quirky self. Are you planning a special look for your big day? 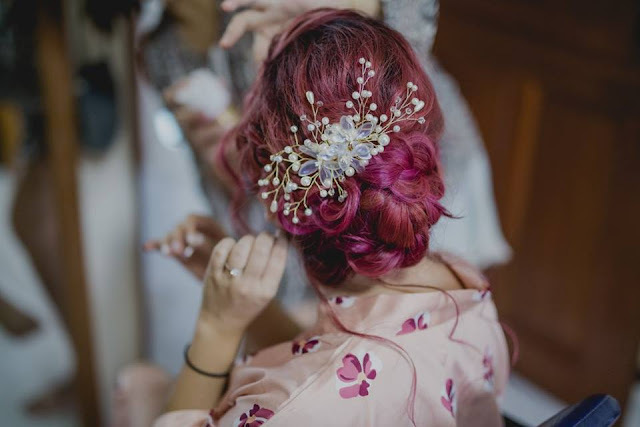 I hope my little post gave you some #bridalhairinspo! If so, do pay them a visit and I am certain you will not be disappointed! Just quote JUNEDUJOUR to get 40% off coloring services or $65 off Senior Stylist cut!